For those that don’t subscribe to the New York Times here is a repost of a great Q & A they had with readers on how to deal with some common pest problems that plague us the the northeast. Story was originally posted here. Here are the first set of answers to questions on roaches, mice, carpet beetles, moths and other creepy crawlies. (The second set will be posted next week.) We are no longer accepting questions for Mr. Braness. There are several types of carpet beetles that are common pests. The adult beetles feed on pollen and do not cause damage. The larvae (1/16 to ½ inch in length depending on species, tan to brown with tufts of hair) cause damage by feeding on a wide variety of animal and plant products including fabrics, furs, stored foods, dead insects, etc. Control of carpet beetles can be difficult. There are a number of steps that you can take that will help solve the problem. Keep them out – Infestations of carpet beetles often originate from outside. Adult carpet beetles may enter on flowers, so inspect flowering plants for adult beetles before bringing them indoors. Carpet beetles also fly and can fit through loose-fitting screens, vents or eaves, so repair screens and seal other openings. Inside, you should store items susceptible to carpet beetle damage in tight-fitting containers. Inspect to locate their source – With a bright flashlight, inspect closets (focusing on woolens or furs), food storage areas in kitchen cabinets and also bird seed and dog food. 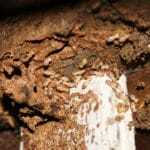 Bird nests, dead rodents and insects can also be a breeding area for carpet beetles. Dry cleaning or brushing/beating clothing items kills carpet beetles and, if done regularly, protects the items from damage. Vacuum to remove food sources and carpet beetles – Focus on food storage, closets and next to baseboards. 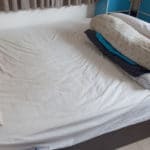 Clean areas below beds and other furniture, including pulling out the refrigerator and cleaning below the kitchen stove. If necessary, apply insecticides to areas of insect activity – Residual insecticides, available in aerosol cans, can be applied carefully to suspected areas of infestation like cracks and crevices, along baseboards, etc. Insecticide dusts are effective when applied into wall voids. Do not apply dusts on exposed surfaces. Resin strips containing the insecticide DDVP may also be useful when used in enclosed areas. Do not contaminate food, and be sure to read and follow all label directions before using insecticides. For severe or persistent carpet beetle infestations, I suggest the services of a pest management professional. Dear eo, I suspect that you are also referring to the Indian meal moth. It is the most common moth infesting food items in homes. Adult moths have a wing span of about 5/8 inch, and the outer portion of their wings are cooper colored. The larvae are about 5/8 inches long and are a dirty white to pinkish color. Sounds like you are doing a lot of the correct things to eliminate the problem. Often it will take several weeks to eliminate all insects, even after you locate and eliminate infested items. The larvae travel some distance from the foods they infest and can be found high up in corners, in cracks and crevices, and behind items as they spin a cocoon to pupate and eventually turn into adults. Use a bright flashlight for your inspection. If you did not vacuum the cracks and crevices of cabinets and other areas where you found the moths and larvae, I’d suggest you do this. As you empty the cabinets, take another look at the food items to insure that they are not infested. Look for webbing that may have formed on infested packaging and foods. Don’t forget to clean below the refrigerator and stove, as many food items can collect in these areas. Be sure to inspect bird seed and dog food as a source of infestation and store these items in tight-fitting containers. If insects are found in your search, remove them or use a residual insecticide to treat cracks and crevices and corners. Always read and follow all label directions before using an insecticide. Dear Madeline Marziotta, You will need to give the treatment more time to work. If after a couple weeks, you are still having a problem, contact the company that did your service. It will likely be more difficult to pest-proof your home for mice in the suburbs. However, I believe it is still advisable to have as many entryways as possible sealed. In addition to the exclusion, you may find that some changes/improvements to your landscape may help reduce pest pressure to your home from mice and other pests. The “genius” you used in the city may know someone in your new area that provides a similar service. I’d check with him first and if that doesn’t work out look for pest management professionals in your new location that provide pest exclusion services. I assume that you are describing the American cockroach, which is also known as a waterbug. Waterbugs are just a nicer, friendlier name for cockroaches in N.Y.C. and elsewhere. In Florida, it is commonly referred to as the palmetto bug. These are large cockroaches that are up to two inches in length, reddish brown in color with a yellow margin around their head. American cockroaches can become very abundant in sewers and will move into structures through drains. If what you are seeing does not fit the description above, you may be dealing with Oriental cockroaches. Adult Oriental cockroaches are about one inch in length and dark brown to black in color. It can also be found in drains, but is not as good at climbing as the American cockroach. 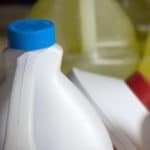 Certainly you will want to continue keeping your drains and garbage disposal clean. However, rather than the Clorox I would recommend that you plug/seal your drain each evening if you are concerned about cockroaches coming up through the drain. There is a section of the plumbing below your sink that is called a p-trap. It is the rounded section that holds water and is important in preventing odors from entering your home. The water in the p-trap also makes it more difficult for cockroaches to enter through the drain. If the sink is not used for extended periods of time, the water can evaporate, making it much easier for cockroaches to enter. The only long-term solution to the problem is to control the cockroaches at their source – in the sewers by pest management professionals and/or city personnel. Anything is possible, but often when you find one cockroach others will also be in the area. b) get the landlord to realize we need more frequent service and/or more intensive treatment? Based on your description, I believe you are referring to the American cockroach. See the previous two questions and answer for more information. The frequency of service is likely not the problem. However, the service is probably not getting to the source. The pest management professional that services your building should inspect nearby sewers for evidence of large populations of American cockroaches. If present, their numbers can be reduced by using residual insecticides and/or cockroach baits. With fewer cockroaches in the sewers there will be far less moving into your building. 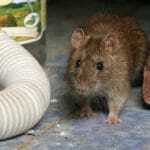 I agree, you need to be thorough with the exclusion measures to keep mice and other pests out. The Combat roach traps you refer to are cockroach bait stations that contain small amounts of a nonrepellent insecticide that is mixed with food ingredients that are attractive to cockroaches. This brand and other cockroach baits are very effective in controlling cockroaches when used properly and when used in combination with good sanitation and exclusion practices. Cockroaches will not be attracted over long distances to the bait, so place the baits near cockroach activity (in out-of-the-way places, and against walls or in corners, as this is where cockroaches travel). Read and follow all label directions. Based on your description it sounds like you are having a problem with European starlings — nuisance birds that create nests inside buildings. They can be very noisy and will also leave behind droppings and nesting material in your attic. This material can be attractive to other pests. Starlings are known to transmit diseases like encephalitis, ornithosis and histoplasmosis. Female starlings produce about two broods per year with four to six eggs per brood. The time of birth is spring and summer. If you chose to solve this problem on your own you will want to seal the opening through which birds are entering and remove the bird droppings and nesting materials. It is also advisable to disinfect the area where bird droppings accumulated in the attic. Be sure to wear protective equipment (goggles, gloves and a respirator equipped with a HEPA filter) when entering your attic. You want to avoid breathing any pathogens that may be in the bird droppings. Depending on the severity of the problem, you may want to bring in a pest management professional that specializes in bird management to inspect your attic and offer a control-and-cleanup solution. 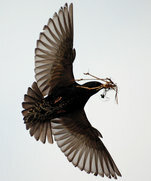 Birds and other pests will return to your attic if it is not properly sealed. There are many species of stink bug, but the one that has caused the most concern is the brown marmorated stink bug. It was introduced from Asia and first reported in the United States in 2001. Since then, it has become a pest around structures and damaged many crops in the Northeast and is spreading. It seeks out structures like homes and apartments in the fall and will spend the winter in wall voids. Exclusion of stink bugs by sealing openings around the outside of the structure is helpful, but not likely to prevent entry of all the bugs. Be sure to do the sealing before stink bugs are active and already in wall voids. You do not want to trap them inside walls as they will become a food source for other insects. The best time to do your exclusion is in the summer after the winter bugs have left and before a new group returns in the fall. Insecticide spray applied to the outside of the structure, just before or soon after the stink bugs appear in the fall, can reduce the number of bugs on the sides of buildings. 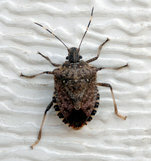 Insecticide dusts to wall voids will also help control the stink bugs. The bugs can also be removed with a vacuum, but the odor emitted by the stink bugs will linger in the vacuum for an extended time. If you are in an area with a lot of stink bugs, it may be best to hire a professional. The best action to reduce your spider and house centipede problem would be to remove the ivy because it makes an excellent environment for pests. Spiders and house centipedes like the abundant supply of tasty insects to feed on, and excess moisture can also encourage pest development around the building’s exterior. Thick layers of mulch, leaf litter and debris are ideal for centipede development. Spiders and house centipedes also do well in damp basements and crawl spaces. Improved ventilation in these areas will help reduce your building’s attractiveness to pests. The screens on the windows should be inspected, especially in the spring when pests start appearing around the outside of the building. Loose-fitting screens or damaged screens are an invitation to pests. Insecticide applications can be made around the outside perimeter of the building and around the doors and windows, under eaves, etc. to control spiders and centipedes. However, without taking the nonchemical steps outlined above, it will be difficult to keep these pests out of the building. NO! Having been involved in the development of pesticides for many years, I am not aware of a single product with this type of activity. Nor would anyone have this objective when developing a pest-control product. Unfortunately, there is a lot of misinformation about pesticides. Many pest management companies are now basing their service on integrated pest management (IPM). This includes inspection, pest identification, recommendation, treatment (nonchemical and chemical) and evaluation. Professionals solve pest problems and are not simply in the business of applying pesticides.